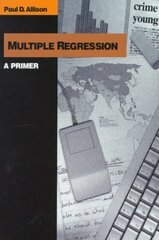 Multiple Regression 1 Edition Multiple regression is at the heart of social science data analysis, because it deals with explanations and correlations. This book is a complete introduction to this statistical method. This textbook is designed for the first social statistics course a student takes and, unlike other titles aimed at a higher level, has been specifically written with the undergraduate student in mind.